For punchcard and electronic standard gauge machines. This garment can be knitted in simple stocking stitch, or with the garter carriage. Using the garter carriage will give the garment texture, which when steam pressed will catch the light and give extra interest to the fabric. Instructions are given for shaping the neckline on the machine. This method is used when knitting in stocking stitch. For garter carriage knitting, a cut & sew neck version is shown, complete with a printed template for the neckline, and full instructions. No ribber is required as the bands are knitted in stocking stitch. To fit sizes 30 - 44 inches (garment measures 34 - 48 inches). 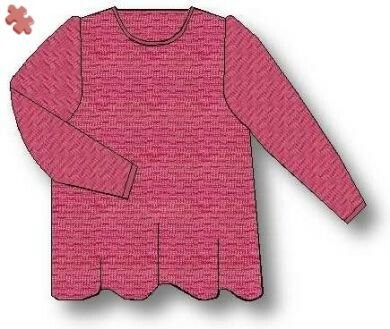 This pattern is suitable for any level of expertise from beginner to advanced, and can be knitted on any Brother, Knitmaster or Toyota standard gauge knitting machine, with or without a ribber. The printed pattern is supplied in a protective plastic sleeve. 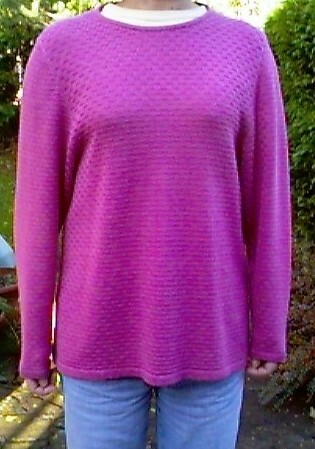 It's also available on CD as part of a collection of six different machine knitting patterns.